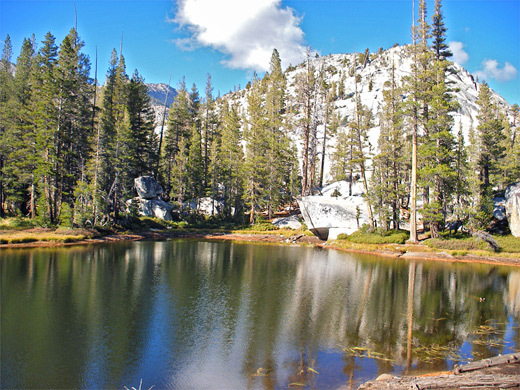 The 1.2 mile path to May Lake is one of the most popular trails along the Tioga Road because of the easy hike and the beautiful setting of the waters, beneath the treeless granite cliffs of Mt Hoffmann. The path, now much less traveled, continues past the lake through more spectacular scenery and enjoys wide views over distant cliffs and canyons, so a trip to this region can range from less than an hour to all day. The trailhead is on the north side of the highway, 3.8 miles west of the Tenaya Lake Campground, and is one of the very few places in this part of Yosemite accessed by a side road - a 1.7 mile track that is paved though narrow, bumpy and not recommended for large vehicles, partly due to the limited parking area at the end. 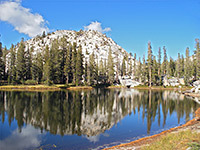 May Lake is the site of one of the five High Sierra Wilderness Camps in Yosemite National Park (and the most easily reached); in summer, as well as the many hikers, the trail is used by mules each day, taking supplies to and from the campsite. May Lake topographic map, Tuolumne Meadows trails. 12 views of May Lake and the lower end of the Ten Lakes Trail. Panorama from a ridge east of May Lake. At the trailhead, paths also lead south to two points along the Tioga Road, but most people are here for the main trail to May Lake. This leads across a bouldery granite hillside and through patches of lodgepole pine trees, ascending quite gently at first then more steeply as it bends south and climbs the side of a small plateau. Turning north once more, the trail enters thicker woodland as the lake approaches. May is quite a large, nearly circular lake, its eastern shores bordered by a belt of trees, and the west edge adjoining the steep granite face of Mt Hoffmann, which drops straight down to the water; a pretty location though made to feel less remote than it might owing to the (sometimes) relatively large number of visitors, and by the cluster of permanent buildings at the High Sierra Camp. Dispersed tent camping close to the lake is allowed along the south & east shores; the north and west edges are closed to protect the delicate environment. Along with Tenaya Lake, May is one of the best, easily-accessed places for photographing the iconic Yosemite image of jagged granite peaks reflected in calm blue waters. Adjacent Mt Hoffmann lies at the very center of the park, and although no official trail leads to the top, the summit can be reached by a relatively easy walk up the southeast slope. 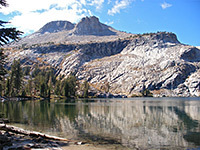 After the High Sierra Camp, the path is now the Ten Lakes Trail and leads deep into the wilderness for 10 miles, around the north side of Mt Hoffmann and Tuolumne Peak, passing many lakes before meeting the Tioga Road again near Yosemite Creek. One target for a half day hike is a ridge after 2 miles that overlooks much remote land to the northeast - from the south edge of May Lake, the trail follows close to the east shore, over a saddle, descends to a small meadow then has a steeper drop through trees and out into the upper end of a wide granite valley, sparsely wooded in places but mostly formed of smooth, open slopes strewn with boulders. The landscape can be seen from above by climbing to the top of a small hill beside May Lake - see panorama. One patch of woodland along the path hides a large, shallow, reflective pond, lacking the dramatic setting of the nearby lake though almost as pretty. Past here, the Ten Lakes Trail climbs an incline to the edge of a plateau high above Murphy Creek, and reaches the viewpoint of lands to the northeast (the views are slightly better from the top of a granite dome, a little way south). 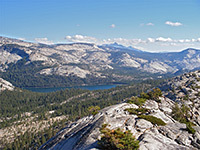 From here, the panorama takes in over 20 miles of the park, across to the high summits that mark the eastern boundary, and over many closer places including Tenaya Lake, Polly Dome and Tuolumne Peak.